How to Manage Brightness, using the Power Control Widget on your Android 4.4.4 KitKat Phone? Brightness control is one of the many functions which some Android 4.4.4 KitKat phone users have to perform many times a day. In daylight, nighttime, evening, sleep time or to save the battery wastage; you have to keep the screen brightness at the suitable level. You may set the brightness level of your Android phone screen by adopting a normal process but it is a little lengthy and cumbersome. But, if you have added the ‘Power control’ widget on the Home screen of your Android 4.4.4 KitKat device, you may set the brightness of screen of your phone by just one tap of finger. 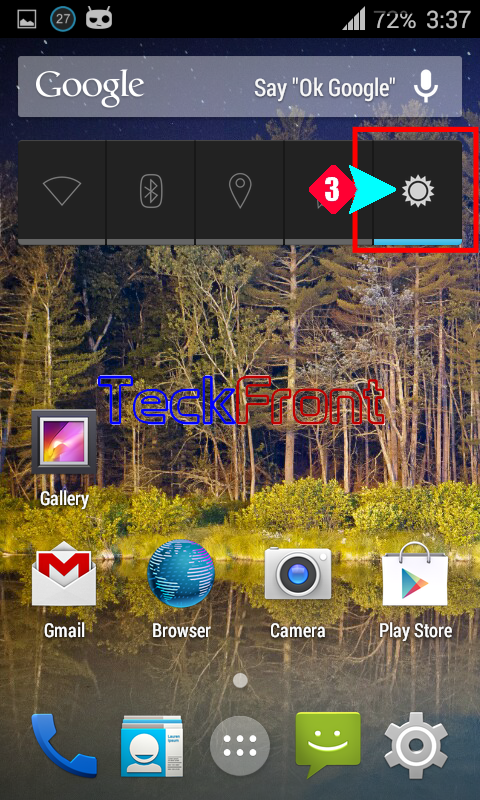 If you have not added ‘Power control’ to the Home screen of your phone, visit our Tutorial on the subject (How to Add Power Control Widget to Home Screen of Android 4.4.4 KitKat Phone?) on TeckFront. 1: Unlock the ‘Home screen’ of your Android 4.4.4 KitKat device. See the ‘Brightness’ button is displaying the minimum brightness level at screen of your phone. 2: Tap the brightness button, for just once and see the Brightness level has reached at the half, displaying the mid-level for the brightness at your phone screen. 3: Tap the brightness button for one more time and see the brightness level has reached at the maximum. 4: Tap brightness button one more time and see the brightness button is now displaying the automatic i.e. Android phone will change its brightness, automatically, depending upon the availability of the surrounding light. Now, enjoy the change of brightness level with just one tap of finger. Newer How to Activate Messages Blacklist in Android 4.4.4 KitKat Phone? Older How to Add Power Control Widget to Home Screen of Android 4.4.4 KitKat Phone?